Theresa May led holidaymakers in a rendition of the national anthem while staying in an Italian hotel. The prime minister and her husband Philip stood up and took part in a singalong of God Save The Queen at the Villa Cortine Palace Hotel in Lombardy. The story, first reported by the Sun, has been confirmed by Downing Street. The newspaper reported that the PM was so pleased by pianist Davide Foroni's performance that she gave him a pair of No 10 cufflinks. 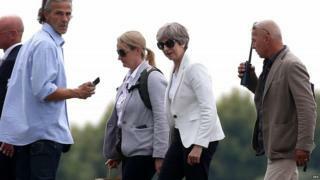 The prime minister and her husband, who are on a three-week walking holiday in Italy and Switzerland, are believed to be regular guests at the five-star hotel on Lake Garda. The Sun reported that Mrs May was among several guests to stand up when the pianist played the national anthem in the hotel bar. The newspaper quoted Mr Foroni as saying: "As soon as the first notes started, she was on her feet with her husband proudly singing along. Everyone stood. There was a mixture of nationalities. The British guests sang the words as well and at the end everyone clapped." Mr Foroni said that afterwards he had discussed music with the PM, revealing that her tastes were "more classical than contemporary". "She likes Whitney Houston, The Beatles and Elton John and classics like Mozart," he added. The director of the hotel, located in the town of Sirmione, told the newspaper that Mr Foroni was a "firm favourite" of guests.